One of Funimation’s bigger announcements last weekend at Sakura-con was the introduction of their first mobile app for Android and iOS devices. The free version will allow fans to see clips and trailers from their favorite shows. The $9.99 paid version will feature full streaming episodes, albeit with commercials. For $7.95, you can get the Elite subscription without any commercial interruptions. It’s great to see more companies jumping on the streaming bandwagon as DVD sales continue to tank. Does anyone know if this will work on Android Media Player set top boxes? Sakura-con Videography: How Could I have missed this many costumes?! It’s no secret that photography is one of the joys of Anime Conventions, but if you want to capture what it’s really like to be walking around out there, you need to switch that camera to video. Every year it’s a combination of a fashion show, science fiction movie, and improv comedy workshop. MLZStudio and ShinWH0 have put together some amazing videos that show off why Sakura-con is so popular and why the Seattle convention centre is such a great venue. Check out more videos after the jump! The weather was perfect for cosplay shooting out at the Convention Center park! The crowds were intense, but the staff was stellar at keeping the foot traffic going. This is part 2 of 4 for our Sakura-con 2012 Cosplay Gallery! 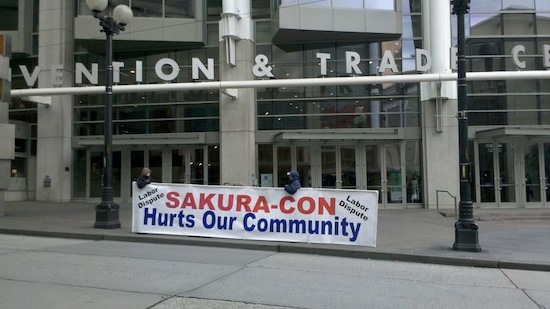 Sakuracon 2012 may be billed as an anime convention, but everyone there knows it’s all about the cosplay! This merely part 1 of our 4 part gallery series! 2012 marks Sakura-con’s 15th anniversary, and they’ve decided to mark the occasion by releasing a commemorative plush! 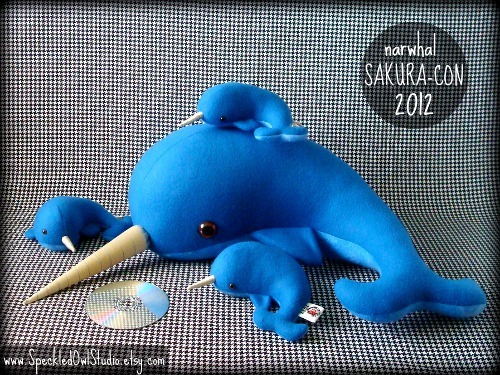 Hokusai the Narwhal is designed by Speckled Owl Studio and is based on this year’s winning Mascot design. This huggable Jedi of the Sea will be available at the Sakura-con Merchandise Booth on the 4th floor of the Washington Convention Center. A heftier version of the plush will be auctioned off over the course of the convention with all proceeds benefitting the Make-A-Wish Foundation. This odd scene came in courtesy of 4chan, and if it weren’t for the supporting documentation (see gallery) I would have assumed it was another photoshop. 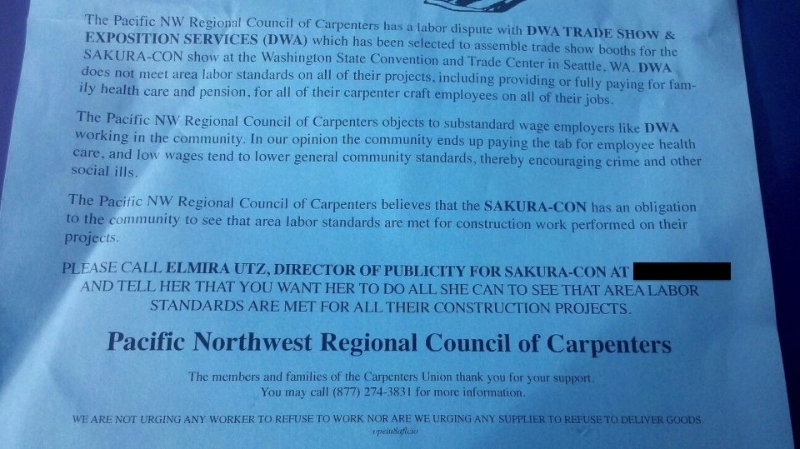 It’s pretty bizarre a Union go after an employer’s customers rather than the employer itself. 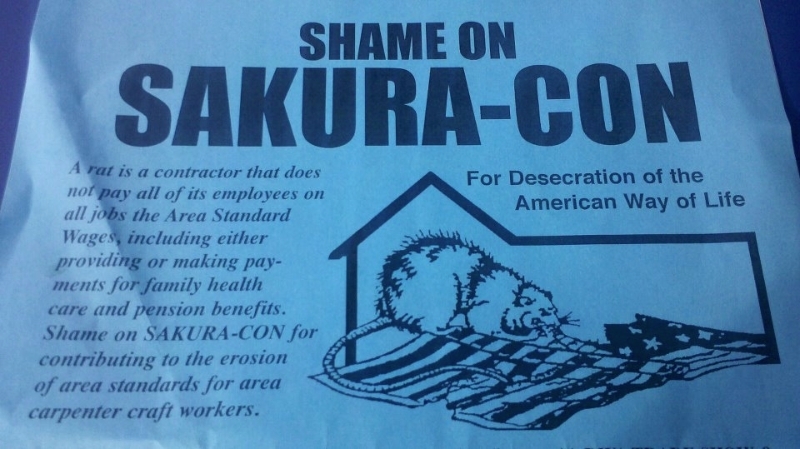 Then again, Sakura-con is a high profile event, so the sign probably makes for a more effective protest. Sakura-con publicity had this to say about the situation. Our position is that we are willing to hear out their copmplaints, but they have done next to nothing to explain themselves. They finally sent us a letter just a couple of weeks ago, far too late for us to make a change. We told them last year to contact us early before we make any hiring decisions, not weeks before out event when we can’t really do anything to make a change. It seems this union is using our well respected, 100% volunteer, 501c3 non-profit event to garner more publicity for themselves more than they seem to be serious about working with us. It’s very disappointing. They are giving out a personal cell phone number on their flyers and unfairly maligning us to the public.